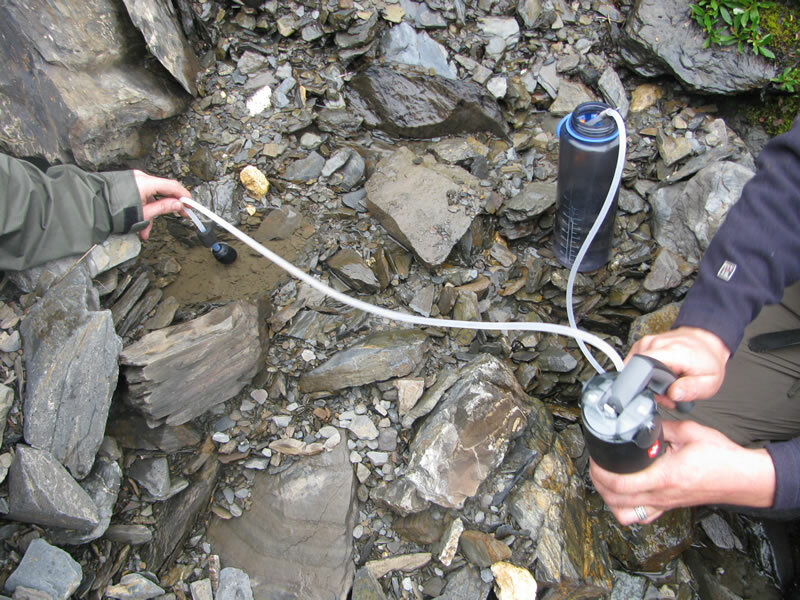 Normally, I have never carried an actual water filter with me on any of my mountain hunting trips. We’ve been drinking water out of the Northern BC mountains for years, actually decades, without ever experiencing a problem. The last few years I’ve brought along the pristine drops but they aren’t all that good at making murky water look appetizing. The drops do work well with clean water though, although I wonder about the “safe” chemicals you need to ingest?? This year I knew our hunt was going to take us somewhere where clean running water might be a little scarce. 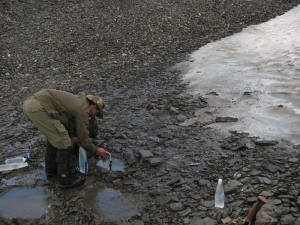 There was going to be 3 guys on this trip, and with water consumption from hard hiking, along with water for mountain house freeze dried meals we wanted something that would pump fast, and eliminate our chances of catching Giardia or Cryptosporidium or any other nasty water borne bacteria. After reading through several online reviews, the Katadyn Vario seemed to fit the bill. An inexpensive little unit at only $89.99 from MEC (yes I know… how dare I…) but it filters out 99.9% of the dangerous bacteria we were worried about. Not only that but the Katadyn Vario will pump along at a nice rate capable of filtering up to 2 liters of water per minute, a claim which I will back up. I think it’s faster but we never actually timed it. One of the cool aspects of the Katadyn Vario is that it actually boasts two different filter settings. There is a fast mode, as well as an extended life mode. Fast is capable of filtering 2 liters per minute, while extended life mode is capable of filtering 1 liter a minute. The main difference being that in long life mode the water is pre-filtered through a ceramic filter before going through the carbon filter. If you’re using the pump in dirty or cloudy water then the extended life mode is probably best. After a few hours into our hike, we were ready to try out the filter. Three of us each had a 1.5 liter nalgene bottle for a total of 4.5 liters of water needed. We found about a 2 foot deep puddle in amongst the rocks, creekside and since it was bug infested and had some intense algae growing along with a few floaties for good measure it was the perfect choice. It was pretty simple… Connected the tubes, threw the float (intake tube) into the puddle and started pumping away. The instructions say to pump out at least a liter or so before actually drinking the water because of the carbon filter and any loose particles that need to be flushed through. We had the filter set to fast flow mode and it pumped like a charm. It was hardly a chore to fill the nalgenes and along with a sock change we were on our way uphill again. The filter performed flawlessly into our trip and then on about the 3rd or 4th day the speed at which it was filtering was definitely degrading, with the pump slowing down and having noticeably more resistance. Some of the reviews I had read actually said they broke the pump handle, and I could see this happening if you’re not careful with it. Instead of destroying the handle on equipment I depend on, we followed the directions and took out the scotch bright pad and rubbed it on top of the ceramic filter to clean it up. We were back in business pumping water as normal. The murkier the water, the more you will perform this simple task and eventually (after several hundred liters) the ceramic filter will need to be replaced. – Easy to use and setup. – Pumps water faster then most competitors units. – Filters out the nasties. – Inexpensive at less than $100.00 through most outdoor retailers. In closing, I am happy with the purchase so far. 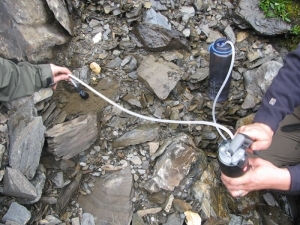 It worked flawlessly on our trek into the mountains and supplied 3 of us with good clean water for nearly 10 days. The filter performed as advertised and pumped even faster then what I expected. If you’re looking for a water filter for your next backpack hunting trip and you need something that can pump a little quicker then most, but still have a limited budget then the Katadyn Vario is definitely a filter you should look into.